Summer adventures at River Legacy Living Science Center provide students with an exciting hands-on, minds-on opportunity to explore the natural world. A variety of weeklong programs in June and July offer children engaging ways to learn about wildlife, ecology and the environment. Age-appropriate curriculums for preschool children through 8th grade. All classes feature investigations both inside the Living Science Center and outdoors in the rich resources of River Legacy Parks. Children should come dressed for both indoor and outdoor explorations. Closed-toe shoes and socks are strongly recommended. Children must be 3, 4 or 5/entering Kindergarten by the session date in which they are enrolled. What would you do if YOU had wings? Learn about some of River Legacy’s wonderful winged creatures and the surprising things they can do with THEIR wings! Spend a week meeting a scaly assortment of River Legacy’s cold-blooded creatures and learn what it takes to be a reptile. What do you do when something wants to EAT you? Learn how some of the animals in River Legacy Park hunt for food and escape from their predators! You know how we use our senses – now learn how animals’ senses help them to survive in River Legacy Park. Explore the special features and abilities that allow certain plants and animals to survive in the watery environments of River Legacy Parks. Meet some of nature’s “transformers” and learn about the mighty big changes they undergo during the astonishing process of metamorphosis. All classes are full day. Please bring a peanut-free sack lunch. Peek inside River Legacy Park’s “art box” and discover the magnificent materials provided by nature and used by artists to create everything from paints and dyes to paper and clay. 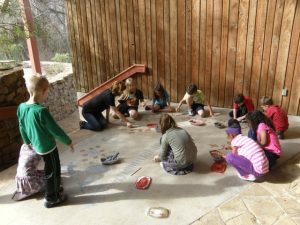 Throughout the week, young artists will gather and work with rocks, soil, flowers and vines to create their own natural art materials and original works of art. Weave puzzling spider questions into answer-catching investigations while spying on the spiders of River Legacy Park. Young spiderologists will create a Spider Sanctuary and discover the secrets of the Arachnida’s most skillful architects and unusual hunters. Can you imagine what it would be like to chase down every meal you eat? Explore the balance of River Legacy Park’s food web through a variety of hands-on activities, including pond investigations, pursuit and capture simulations, and animal observations. Did you know that over 90% of all known species on our planet are insects? Did you know not all insects are bugs? As an Insect Investigator, you will practice lab and field techniques that include identifying species under a microscope, catching and releasing live specimens, and creating your very own field guide. Is animal training and behavior your thing? Gain incredible training and handling experiences and get the inside track on animal behavior while you work alongside our Naturalists. Use your newfound knowledge to design and build enrichment devices and activities for the wildlife that call our Nature Center their home! Do you have what it takes to be a Zoo Keeper, a Veterinarian, an Aquarist, or a Conservationist? Join the Naturalist team and some special animal and human guests to take a hands-on look at what it takes to work with all kinds of animals! Kick your summer fun up a notch! Spend a week exploring the fun that can be had at River Legacy through kayaking, hiking, rock climbing, learning how to survive in extreme conditions and so much more! PLEASE NOTE: Students in full day classes (9 am to 3 pm) should bring a lunch and drink. To help us safeguard the well-being of all of our students, please do not send peanut butter or other peanut products. Tuition is due in full at registration. Refunds (less a $25 processing fee) are made only for written withdrawals 30 days in advance of the first class meeting. If a class is canceled by the Science Center, a full refund will be made. Once registration is complete, a fee of $25 will be required for each change of class request. A request must be submitted in writing.